a world where the human dignity be respected. The European Investment Bank (EIB) today signed five agreements making it possible to provide EUR 151m for investment in innovation in several sectors of the Spanish economy, such as pharmaceuticals, transport and the automotive industry. Part of this financing will be used to support innovative midcaps with the goal of creating jobs in convergence regions. The EIB has also granted a loan for renovating buildings to cut their energy consumption and make them more efficient. With these objectives, the EU bank will help finance the investments of Axiare, Batz, INCARLOPSA, Laboratorios Farmacéuticos Rovi and Talgo. All of these projects are supported by the European Fund for Strategic Investments (EFSI), the central pillar of the Investment Plan for Europe (commonly known as the Juncker Plan). The EIB has granted a EUR 45m loan to Laboratorios Farmacéuticos Rovi to finance its RDI programme focusing on technologies for the administration and extended release of medication, including pre-clinical development and clinical trials that could help develop future treatments to fight cancer and nervous system diseases. In concrete terms, the Spanish company specialised in researching, developing and marketing proprietary pharmaceuticals will conduct the research needed to market its new products. The investments will be made over the next three years in RDI centres spread across the regions of Madrid and Andalusia. Again with the goal of supporting innovation, the EIB has signed a EUR 30m loan with Talgo to facilitate its investments into the technological development of high-speed trains, making it possible to improve their safety, comfort and energy efficiency. The project financed by the EU bank will also focus on commuter trains: a major portion of the investment will centre on developing Talgo's new prototype for the electric trains for short and medium-length journeys segment. The implementation of this RDI programme will enable Talgo to offer new products, speed up its expansion outside Spain and create jobs. The EIB is also providing Investment Plan for Europe support to Batz. Part of the Mondragón Corporation, the company has been granted a EUR 25m loan for its innovation and growth strategy centred on the development of technologies for designing innovative products, with the aim of manufacturing lighter and more aerodynamically efficient vehicles to cut CO2 emissions. The project will also have a positive impact on job creation, enabling the company to reach 2 000 employees in 2020. Industrias Cárnicas Loriente Piqueras SA (INCARLOPSA) has signed a EUR 35m loan with the EIB to finance an expansion of its production capacity. The EIB financing will enable it to modernise its plants in Tarancón and Corral de Almaguer. By deploying new technologies on its production line, INCARLOPSA will be able to optimise its energy efficiency and improve the working conditions of its employees via improved automation of its production processes. The new investment will improve checks on the application of animal hygiene and safety protocols, as well as the traceability of all of its products. The project will make it possible to create 1 000 jobs in its factories in Castilla La Mancha during the implementation phase. With the aim of combating climate change, the EIB has provided a EUR 16m loan to Axiare Patrimonio to improve the availability of energy efficient buildings on the Spanish market. This is the first operation of its kind that the EIB has signed in Spain under the loan programme created to finance improved energy efficiency in buildings. Following renovation, heating, ventilation systems, air conditioning and lighting will adhere to energy standards making it possible to optimise their consumption, promote the application of renewable energies and cut the CO2 emissions of the buildings. Despite repeated efforts, for almost two years, to engage the Polish authorities in a constructive dialogue in the context of the Rule of Law Framework, the Commission has today concluded that there is a clear risk of a serious breach of the rule of law in Poland. The Commission is therefore proposing to the Council to adopt a decision under Article 7(1) of the Treaty on European Union (see Annex II). The European Commission is taking action to protect the rule of law in Europe. Judicial reforms in Poland mean that the country's judiciary is now under the political control of the ruling majority. In the absence of judicial independence, serious questions are raised about the effective application of EU law, from the protection of investments to the mutual recognition of decisions in areas as diverse as child custody disputes or the execution of European Arrest Warrants. The Commission has also today issued a complementary (4th) Rule of Law Recommendation, setting out clearly the steps that the Polish authorities can take to remedy the current situation. Should the Polish authorities implement the recommended actions, the Commission is ready, in close consultation with the European Parliament and the Council, to reconsider its Reasoned Proposal. Furthermore, the Commission has decided to take the next step in itsinfringement procedure against Poland for breaches of EU law by the Law on the Ordinary Courts Organisation, referring Poland to the Court of Justice of the European Union. Whilst taking these unprecedented measures, the Commission maintains its offer for a constructive dialogue to remedy the current situation. Over a period of two years, the Polish authorities have adopted more than 13 laws affecting the entire structure of the justice system in Poland, impacting the Constitutional Tribunal, Supreme Court, ordinary courts, National Council for the Judiciary, prosecution service and National School of Judiciary. The common pattern is that the executive and legislative branches have been systematically enabled to politically interfere in the composition, powers, administration and functioning of the judicial branch. The Reasoned Proposal sets out the Commission's concerns, recalling the steps taken under the Rule of Law Framework and the numerous contacts with the Polish authorities to try to identify a solution, and invites the Council to find that there is a clear risk of a serious breach of the rule of law. The concerns relate specifically to the lack of an independent and legitimate constitutional review and judicial independence. Should the Polish authorities implement the remedial actions set out in the Rule of Law Recommendation accompanying its Reasoned Proposal, the Commission is ready to reconsider the Reasoned Proposal. The Rule of Law Recommendation adopted today complements three previous Recommendations, adopted on 27 July 2016, 21 December 2016 and 27 July 2017. Today's Recommendation focuses on the fresh concerns raised by the new law on the Supreme Court adopted by the Polish Parliament on 15 December 2017 and the law on the National Council for the Judiciary adopted on 15 December 2017. The Polish authorities have still not addressed the concerns identified in the first three Commission Recommendations, which remain valid. Refrain from actions and public statements which could further undermine the legitimacy of the judiciary. The College of Commissioners also decided to refer the Polish Government to the European Court of Justice for breach of EU law, concerning the Law on the Ordinary Courts and, specifically, the retirement regime it introduces. 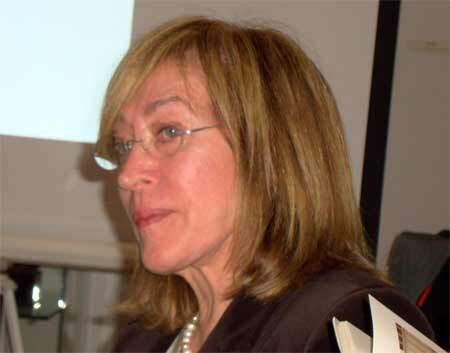 The Commission's key legal concern identified in this law relates to the discrimination on the basis of gender due to the introduction of a different retirement age for female judges (60 years) and male judges (65 years). This is contrary to Article 157 of the Treaty on the Functioning of the European Union (TFEU) and Directive 2006/54 on gender equality in employment. In its referral to the European Court of Justice, the Commission will also raise the linked concern that the independence of Polish courts will be undermined by the fact that the Minister of Justice has been given a discretionary power to prolong the mandate of judges which have reached retirement age (see Article 19(1) TEU in combination with Article 47 of the EU Charter of Fundamental Rights). The Commission's Recommendation invites the Polish authorities to address the problems within three months, and to inform the Commission of the steps taken to that effect. The Commission stands ready to pursue a constructive dialogue with the Polish Government. Should the Polish authorities implement the recommended actions, the Commission is ready, in close consultation with the European Parliament and the Council, to reconsider its Reasoned Proposal. Under Article 7(1) TEU, the Council must hear Poland's position and obtain the consent of the European Parliament (on the basis of Article 354 TFEU, the European Parliament shall act by a two-thirds majority of votes cast, representing the majority of its component Members), before adopting a Decision by a four-fifths majority (22 of 27 Members of the Council entitled to vote on the basis of Article 354 TFEU), determining that there is a clear risk of a serious breach of the rule of law. The Council may also address recommendations to Poland, acting in accordance with the same voting procedure. Article 7(1) of the Treaty on European Union provides for the Council, acting by a majority of four fifths of its members, to determine that there is a clear risk of a serious breach by a Member State of the common values referred to in Article 2 of the Treaty (see Annex II). The Commission can trigger this process by a reasoned proposal. It is up to Poland to identify its own model for its justice system, but it should do so in a way that respects the rule of law; this requires it to safeguard the independence of the judiciary, separation of powers and legal certainty. A breach of the rule of law in one Member State has an effect on all Member States and the Union as a whole. First, because the independence of the judiciary – free from undue political interference – is a value that reflects the concept of European democracy we have built up together, heeding the lessons of the past. Second, because when the rule of law in any Member State is put into question, the functioning of the Union as a whole, in particular with regard to Justice and Home Affairs cooperation and the functioning of the Internal Market, is put into question too. The European Commission opened a dialogue with the Polish Authorities in January 2016 under the Rule of Law Framework (see Memo for more details). The Framework – introduced by the Commission on 11 March 2014 – has three stages (see graphic in Annex 1). The entire process is based on a continuous dialogue between the Commission and the Member State concerned. The Commission keeps the European Parliament and Council regularly and closely informed. The Commission has attempted to work constructively with the Polish authorities, as they have passed more than 13 laws impacting the Constitutional Tribunal, Supreme Court, ordinary courts, national Council for the Judiciary, prosecution service and National School of Judiciary. The European Parliament has consistently supported the Commission's concerns, including in the three Resolutions of 13 April 2016, 14 September 2016 and 15 November 2017. In addition, on 16 May 2017, the Commission informed the General Affairs Council of the situation in Poland. A very broad majority of Member States supported the Commission's role and efforts to address this issue, and called upon the Polish Government to resume the dialogue with the Commission. The Commission provided a further update to the General Affairs Council on 25 September 2017, and there was broad agreement on the need for Poland to engage in a dialogue to find a solution. A wide range of other actors at European and international levels have expressed their deep concern about the reform of the Polish justice system: representatives of the judiciary across Europe, including the Network of Presidents of the Supreme Judicial Courts of the European Union and the European Network of Councils for the Judiciary, the Venice Commission, the Commissioner for Human Rights of the Council of Europe, the United Nations Human Rights Committee as well as numerous civil society organisations such as Amnesty International and the Human Rights and Democracy Network. As we have often stressed when talking about contemporary art, we must never forget that it is an art that is based on a concept, so they are creations that involve a deep and long experience in conceptual development before it becomes embodied. 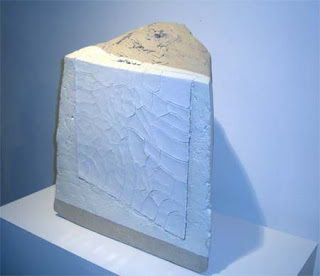 Koldo Sebastian, during the presentation of his work, he defined his conceptual process, from choosing the alphabet used for creation - the square as the entire area, its half and quarter - the colours, again a triad emerged from the stones of Cap de Creus, which show a variation in zinc white, slate gray and natural shadow, which are sometimes shown when they are dry or when wet. From here Koldo Sebastian has created compositions that could be understood well as puzzles that allow all solutions, because it is also implicit in its creation - as it said - the idea that the master of Bramante (architect who designed the reconstruction of St. Peter's Basilica in the Vatican) had given him as a parting gift when he left his workshop, offering a leather case and saying, "When you have a problem you do not know how to solve, this case open, but not before ", when Bramante opened it he found a ruler and a note:" if you can measure, you can solve. " Calignometrias is an acronym, it speaking of perfection (cali) of perfect angle (gnom) and measurement (metrias). 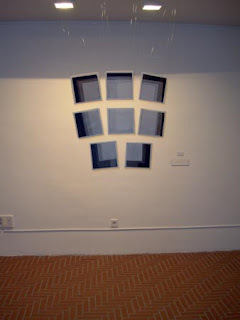 The right angle - the angle perfect - is present in the square, the middle and quarter - so to speak – it is the hinge that allows realized the proposed. 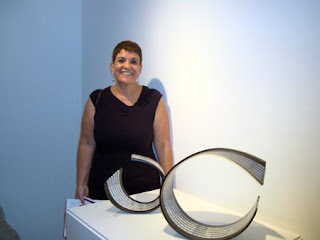 The exhibited works include paintings and volumetric (the author does not want to talk about sculpture, although it is three dimensions compositions), and are the result of ten years of work. soul of Les Quintanes and a big artist too. 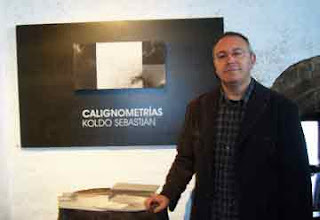 With respect to the observer who want to see Calignometrias (or any other work of contemporary art) is crucial to understand that: to enjoy things, you do not need to know all about these things (an observation result of a story lived by himself Koldo Sebastian on a visit to Japan). 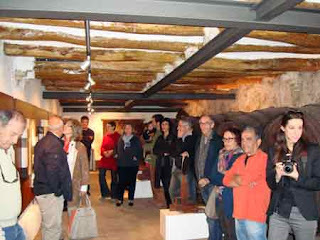 Concluding the opening ceremony was served an appetizer in collaboration with Cava Jané Ventura of El Vendrell. - I thought, what they would feel when flying. - Why waste your time thinking on something that is impossible? Maybe all we have to think the impossible, maybe even we would get the courage to fight for making dreams come true! Next December 1, Immaculada Socias presents a The Hispanic Society of America the book The Correspondence between Isidre Bonsoms Sicart and Archer Milton Huntington: The Collecting of Antique Books and works of Art. 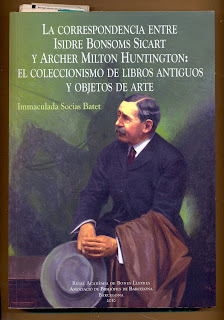 Immaculada Socies Professor of Art Departament of the Barcelona University (UA) could wrote this book about the correspondence between these two lovers of books and art, because The Hispanic Society of America preserved nearly a hundred letters of this correspondence, that goes from 1903 to 1913. Archer Milton Huntington was the most influential person in the field of studies of Hispanic Culture in the United States during the first half of the twentieth century. His most popular and more durable contribution was the creation of the Spanish Museum founded in 1904. Over fifty years the filled the museum with its collections of paintings, decorative arts, manuscripts, maps, prints and photographs. Among his travels he rebuild the road of the Cid between Burgos to Valencia, it was in 1892. Regarding the content of this Museum you could see paintings by El Greco, Goya, Sorolla, as well as notable pieces of medieval art. In decorative arts you can highlight the Custody from the Church of Saint John, made by Cristobal Becerril, around 1585. As for the sculptures, there are samples of the tombs from the Monastery of San Francisco de Cuellar, among others. Or about the old books you can see an edition of Don Quijote from 1605 by Juan de la Cuesta. The library contains over 250.000 books and news papers, about 15.000 are prior to 1701, and more than 200.000 manuscripts from the twelfth century onwards. As for Isidre Bonsoms a catalan bibliophile who started a library – he gifted it to the Institute of Catalan Studies – with a celebrated collection dedicated to Cervantes, as well as prints covering the fifteenth to the nineteenth century (Briefs Bosoms) there are over 5.000. Another collection from Spanish literary works prior or contemporaneous to Cervantes, and the oddities of manuscript of the Decameron in Catalan, or a unique piece of Tirant lo Blanc translated in Spanish. 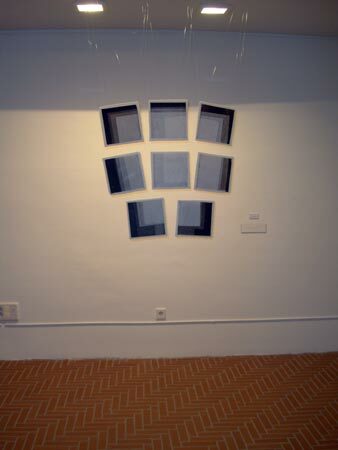 Just the next October 30, you could to see this exposition at the Saló Portal del Pardo al Vendrell. The exposition shows you the works of the VI Biennal de Ceràmica del Vendrell, works made for artist of the different countries. 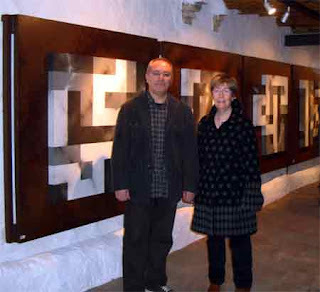 In total 17 works and artist, come from United Kingdom, USA, Turkey, Switzeland, Belgium, Argentina, Poland, Austria, and Spain, in this case the artist come from Valencia, Huesca, Tarragona, Barcelona and Girona. 1st – Yeraz Vi – by Monique Wuarin (from Jussy, Swtzeland) work in porcelain stoneware, porcelain and lacquer. 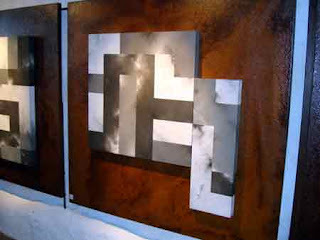 44 x 50 x 25 cm. 2n. 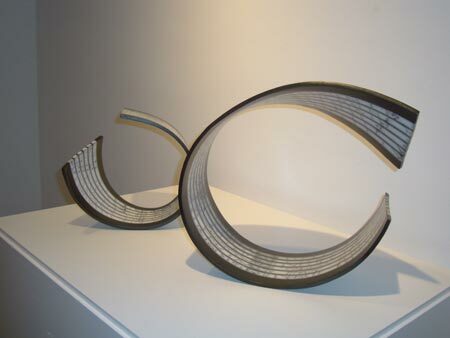 Flow Motion – by Simcha Even-Chen (from f Rehovot , Israel), work in porcelain stoneware adnd porcelain. 36 x 90 x 50 cm. 3rd. 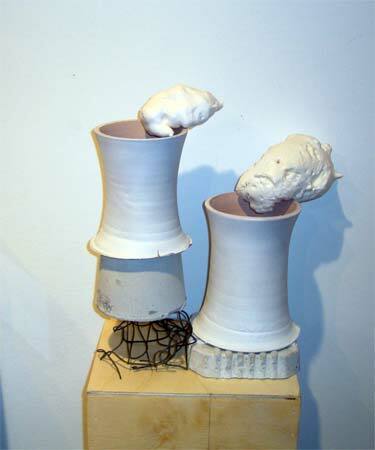 – The White Plumes – by Todd Shanafelt (from Mankato, United States) work in clay, wood, metal and polystyrene 50 x 65 x 25 cm. Mention: Fragment or Window - by Cristina Marquez (from Barcelona, Spain), work in porcelain, 70 x 70x 30 cm. The opening ceremony was attended by Benet Jané, Mayor of the Town Hall of El Vendrell and Martí Carnicer, Deputy Major, and the jury has made the selection of the works and the selections of winners, composed by Albert Solé Councillor for Culture, M. Teresa Capet, ceramist; M. Àngels Domingo, ceramist; Josep Miquel Garcia, Director of the Museum Apel•les Fenosa, Gemma Sabaté, head of he Art Collection of the Towm Hall and Immaculada Socias, Professor of Art History. Albert Solé, Councillor for Culture, said that the exhibitions were themselves the culmination of the creative process that begins with the intellectual work of the author, involves the physical embodiment in the studio and just work the presentation to the public because it captures the perceptions that the work produces in each one of them. 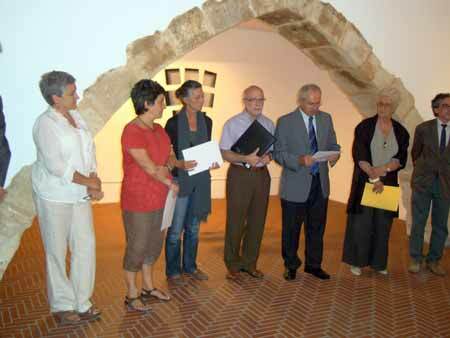 About the VI Biennal de Ceràmica del Vendrell, he highlighted it could be summed with the words Strength, Balance and Sensibility. In this last line M. Angels Domingo, president of the jury, pointed the daring of the authors to face the creative challenge, as well as strength, balance, and sensibility mentioned before. Meanwhile Benet Jané welcomes the line of this exhibition in their past twelve years developing, and invited to remain expectant face to the exhibition next year of the award-winning artists.